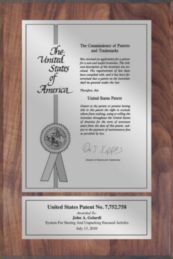 Our Contemporary patent display plaques feature your patent's ribbon page, including the United States Patent & Trademark Office (USPTO) seal. Your abstract and front page drawing are reproduced on the presentation plate in amazing detail. The custom-engraved presentation plates come in silver or gold and are mounted on your choice of walnut, oak, cherry or black satin stain finish. 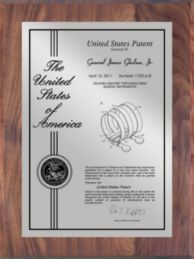 Each solid wood patent plaque plaque is hand polished and includes a keyhole on the back of the plaque for easy wall hanging. Want to add a company logo or university seal? No problem. Our design team will work with you to create the custom plaque you want at no additional charge. If you don't see what you are looking for, please call our IP Award Specialists to see how we can help you. 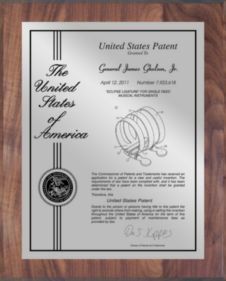 Watch our video below to learn more about the Contemporary Series Patent Plaques.